Wiraqocha was the god who created the universe. Indeed, he created Pachamama, that all powerful goddess I wrote about a couple of days ago. You´d think that after visiting so many Inca ruins over the past week that we´d get bored of the Inca ruins. Not. Each one has been so incredibly different that every visit feels like the first time all over again. In this case, Wiraqocha is unique because it´s one of the only known surviving Inca sites where columns were used as part of the construction. 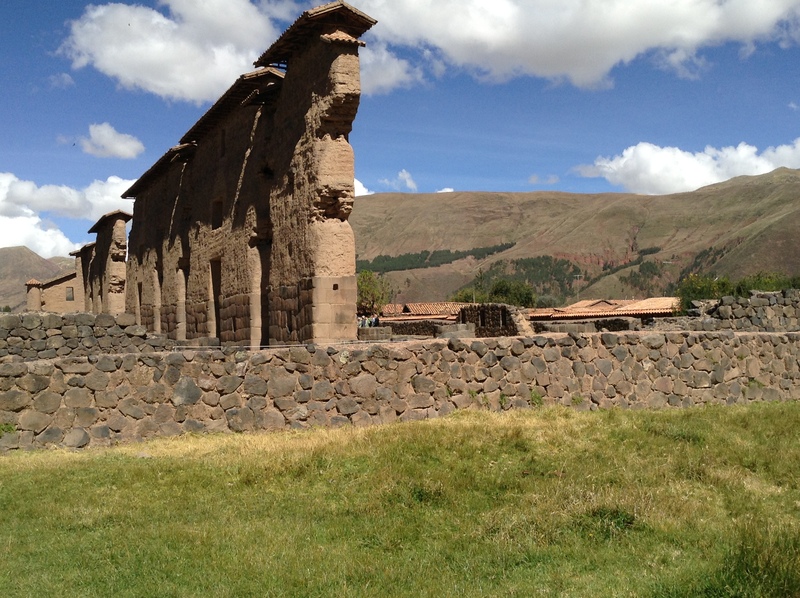 In addition, the walls of the temple (you can see the surviving portion in the photo below) are the tallest Inca walls that have been discovered. After passing through the town of La Raya, which was the highest point on our tour at 14,220 feet, we drove through Juliaca, which is the wild wild west of Peru. Most of the inhabitants´ money is earned through smuggling goods from Bolivia and Chile. The roads are not paved, the homes are unfinished and those who have cars drive like maniacs. 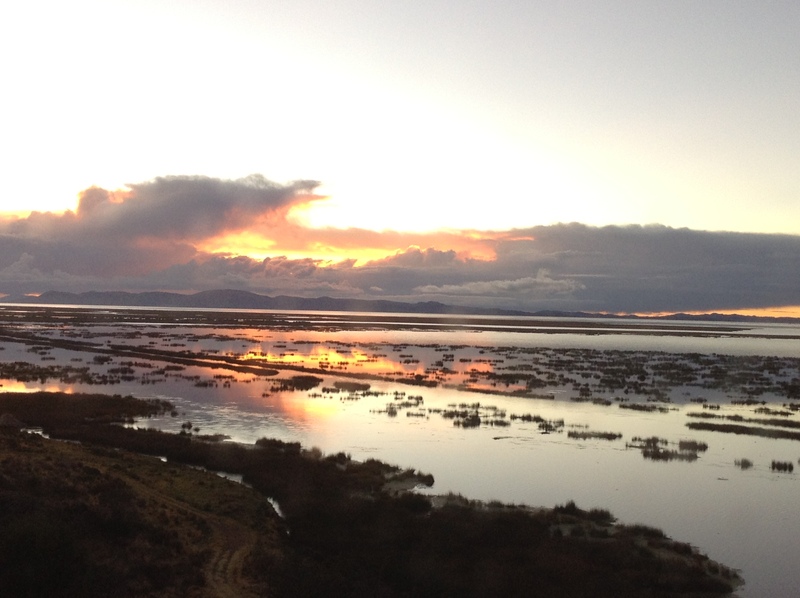 We arrived at our hotel yesterday evening and woke up this morning to a gorgeous sunrise over Lake Titicaca which, at an elevation of 12,500 feet, is the largest navigable lake above 6,000 feet. The air is definitely thinner here and you experience shortness of breath after taking just a few steps uphill, but the blue of the sky is so incredibly crisp that it doesn´t look real. It´s hard to remember that you´re so high up, because let´s face it, it´s not normal for a lake to be so big (larger than Puerto Rico and twice the size of Luxembourg) at this altitude. We took a boat tour of the lake, stopping first on the tiny reed island of Suchi Maya, which is part of the Uros group of floating islands. These islands have been continuously inhabited for about 600 years. After the Incas started to conquer the indigenous tribes, the tribespeople fled to the mountains or to the lake, where they built islands made of reeds. Today, the Uros comprise approximately 70 of these man-made islands and serve as home for about 2,000 people who are all descendants of the pre-Inca tribes. The reeds serve multiple purposes: they form the ground of the islands, they are used for the construction of the houses and the boats, and are a good source of edible iron for the people who live there. The residents don’t pay taxes and receive very little from the government, so their primary sources of income are tourism and fishing. Life is challenging on these small islands. Those who stay primarily remain because living on the mainland would be too costly. Teenagers go to the mainland for high school, and about 80% don´t return. Those who do come back tend to be women who care for their elders. Needless to say, the population is declining. These people lead very simple lives. They spend their days maintaining their little islands (one island will last about 30 years, but the reeds need to be reinforced with new reeds every couple of weeks), fishing and making handicrafts for the tourists who visit by the boatload. The island we visited, Suchi Maya, was very small. Six families live there. They are a very warm and welcoming people, who have few material possessions other than a couple of solar panels for electricity, and maybe an old tv or a radio. 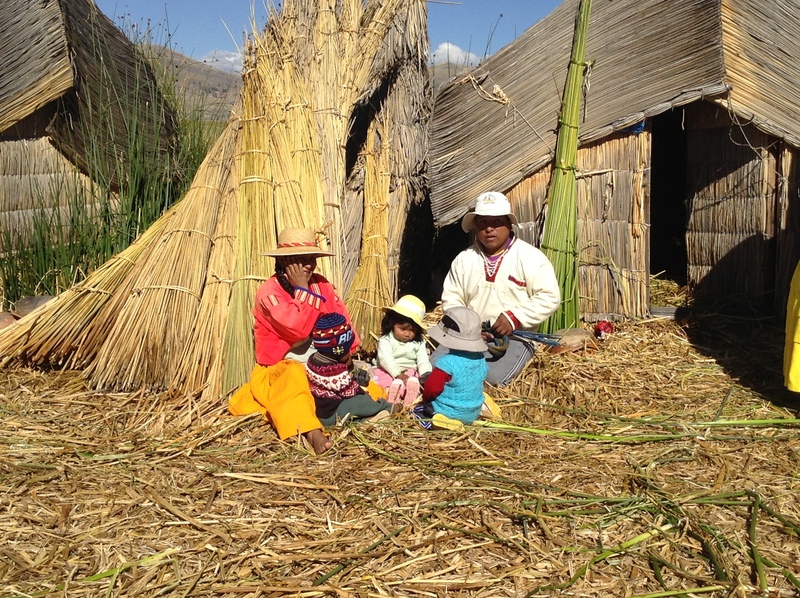 Their one-room homes are made entirely of reeds and they cook their food under the stars. Seeing the young children playing and horsing around and looking extremely happy was quite a sight. I missed Chloe and Sophie when we were there – and thought about how our lives are so incredibly complicated, thanks in large part to technology and the accumulation of stuff. 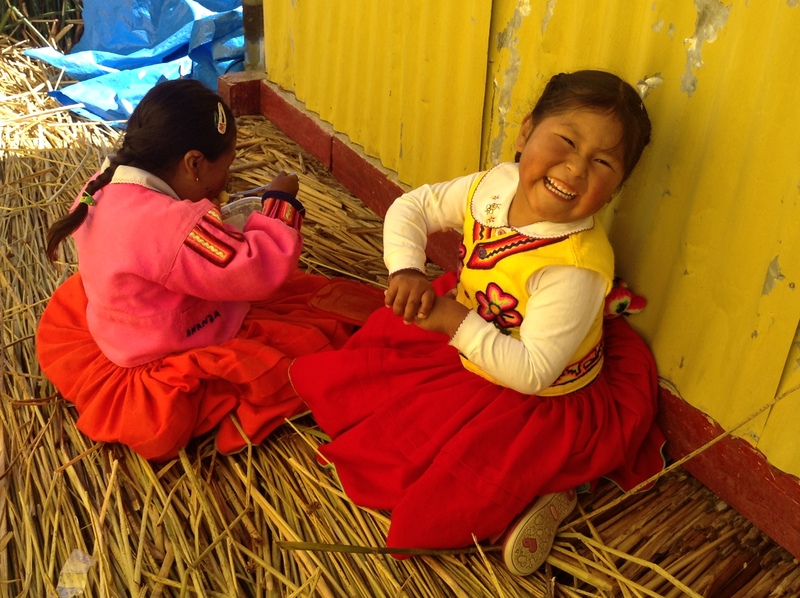 Are the children on the Uros Islands any less happy than our kids in the States? After spending a few minutes with the little ones at their school, I would venture to say that they are not. Our next stop was Isla Taquile, an island on terra firma that has UNESCO world heritage status because of its famous textile weaving. Taquile has 2,500 residents who are direct descendants of the Incas. Life is easier here than on Uros (relatively speaking, of course) and children end up staying here 80% of the time, likely because they attend high school on the island, which limits exposure to the temptations that can be found on the mainland. 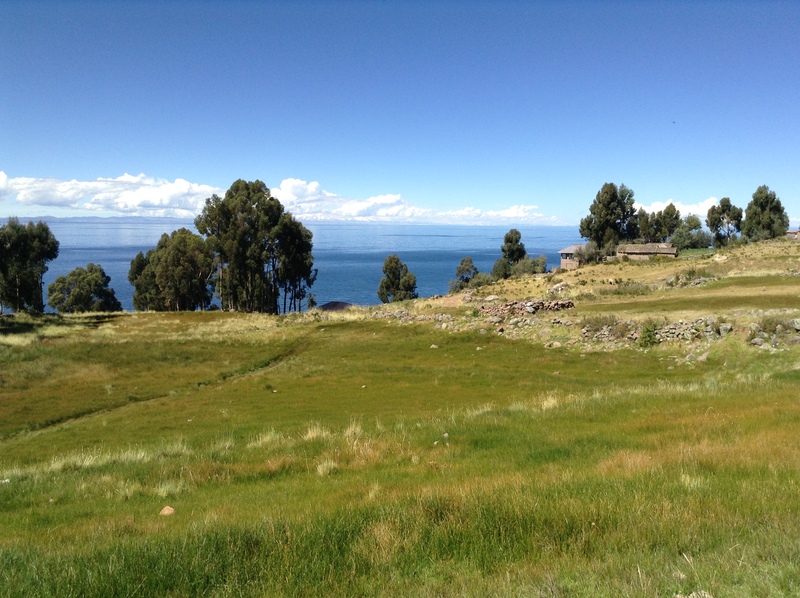 It also helps that the views from the island are exquisite – the lake, a mirror of deep blue, and the snow-capped Bolivian Andes on the horizon make for an unforgettable image. More reserved as a society than the people who live on the Uros islands, Taquile Island is also a fairly chauvinistic place, where the women are extremely submissive to their men. That is, except in one respect. The men are knitters. They knit clothes for the entire family. Indeed, the style of hat they knit and then wear signals to the women on the island whether they are single or married. If a young single man´s hat is well-knit, it will be easier for them to find a wife, so they start knitting at a very young age and spend years perfecting their art. It´s hard to believe that people still live like this. And yet they do, mostly insulated from the wider world beyond them, except for the tourists who provide them the means to continue their traditions. I can´t imagine it will last for much longer, as the younger generations migrate elsewhere to make lives for themselves that aren´t as physically and financially challenging. But I´m so glad I had the chance to see it myself, for interacting with these people was a unique and incredibly special opportunity.